What is International Olympiad of Informatics? Started in May 1989, by UNESCO, the International Olympiad in Informatics (IOI) is one of the five International Science Olympiads organized around the world. The primary aim of the contest was to stimulate the interest of middle and high school students in informatics and information technology. It also brought the pupils from different countries at one podium to share cultural and academic experiences. The contest comprises of several tasks (problems). All the problems in the contest are algorithmic in nature. However, the students also need to have other skills like problem analysis, data structures, design of algorithms, programming, and testing to solve those problems. There will be two competition days. On each day contestants will be given three tasks to complete in five hours. Students have to write the solutions to the problems in C++, Pascal or Java and submit it inside the 5-hour duration of the contest. All Indian students who are enrolled in a school in the current academic year, regardless of the board and school they are studying in. Students who have passed out of their school, but have not taken admission in any college are still eligible, given that are appearing in the contest on the same year. Students should not be older than 20 years on the 1st of July of the year of IOI they are appearing for. There is no lower age limit for participation. Nature Of Contest: Algorithmic. However, the students also need to have other skills like problem analysis, data structures, design of algorithms, programming, and testing to solve those problems. At the felicitation ceremony, after the contest, the participants are awarded medals based on their performance in the competition. The medals are awarded to top 50% of the participants, in a way that the ratio of gold: silver: bronze: no medal is around 1:2:3:6 (thus around 1/12 of the participants get a gold medal). Unlike all the other science Olympiads, the IOI prohibits ranking by countries. 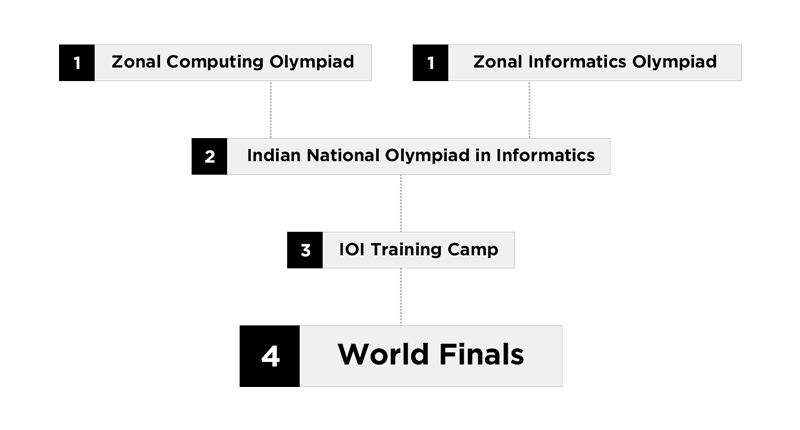 The Zonal Informatics Olympiad is the first step towards the IOI world finals. It is an offline written test. However, there also is an online variant of it known as Zonal Computing Olympiad (ZCO), which is an online programming contest. Most of the questions in these contests involve algorithmic techniques; however, even logic is suffice to get you through this first round. Students have to pay nominal fees of approx Rs.250/- towards the registration process. Students have to register online on the IARCS website. The contest is held in the month of November/December every year. Around 250 students from all the participants are selected for the next round. You can appear in any one of the exams, ZIO or ZCO and be eligible for selection to the next round. Students qualifying the ZCO or ZIO (whichever you take up) moves on to the second round of the competition, the INOI. It is a programming competition. The questions here are similar to the ones that students will be subjected to at the International Olympiad of Informatics world finals. Students have to solve two algorithmic problems in three hours. The students can write their programs in either C, C++ or Java. The contest is held at various centers across India. Base on their results in INOI, 30 students are selected to take part in the International Olympiad in Informatics Training Camp. Organized by the Indian Association for Research in Computing Science, the IOI training camp is held in the month of June at the, The International School Bangalore (TISB) for selecting the final 4 students to represent India. This training camp in general is of 2 to 3 weeks. It is the final chance for the selected 30 students to sharpen their programming talents, before putting them to test at the world finals. The students train under the guidance of Prof. Madhavan Mukund of Chennai Mathematical Institute, who also is the President and Member, Executive Council, Indian Association for Research in Computing Science (IARCS) and Executive Director, International Olympiad in Informatics. Along with Prof. Madhavan, students who have previously appeared in competitions like IOI and ACM ICPC provide rigorous training to the students at this camp to ensure that the students are well prepared for the World Finals. The IOI world final is hosted by any of the 91 countries and regions presently registered with the International Olympiad in Informatics. However, every participating country hosts their own prelims to select the students representing them at the world finals. Every participating country sends a delegation of 4 students and 2 adults, accompanying them as a coach or mentor. The two-day long contest sees students competing individually by solving a set of informatics problems. The contest is followed by some cultural and recreational events organized on the remaining days. CodeChef has extended its coveted Go for Gold program to Indian Middle/High School students. The program is planned to serve as a motivation to the school students to do well in programming and eventually win a Gold medal at the International Olympiads in Informatics. The details of the program can be read here.